Category: Duo Series, Duo R.	Tags: Up to 17hh. 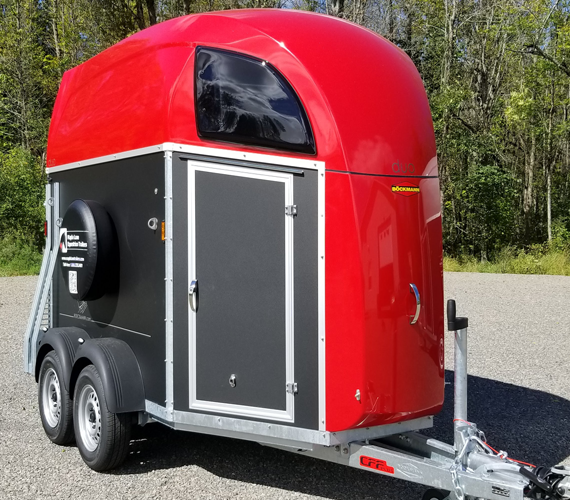 The Light Duo R Horse Trailer is the “all-you-need” trailer! The light Duo R is an all-purpose horse trailer with a sporty feel, but with all the safety features of the up-graded models. For horses comfortably to 17hh, the Duo R series offers safety features from back to front. The integrated rubber safety treads on the rear ramp prevent horse or rider slipping during inclement weather. All stall bars are adjustable to create the correct length of stall to fit your horse or pony. Release the stall bars from outside the trailer using the MSS external release system, in the event of an emergency. Tinted pop-out windows reduce glare for the horses. Window placement allows air to gently enter the stall area and take the heat out the back of the trailer. Trailer tie rings, hay net ring and snack bowls atop of the saddle chest box allow you to create a safe comfortable space for your horses. You can tie your horses to the feet on the rear closed ramp, when working outside your trailer. Add a tie bar for $160, which will also hold an English saddle. The Duo R offers the clear PVC dividing curtain hanging from the tubular steel stall divider. The PVC is clear, to keep that sense of open space, allowing the 2nd horse to see its buddy- like standing in the herd together. The bright white interior leaves no dark corners, creating a welcoming space. The 7’6″ internal height keeps an open feel to the trailer. Telescopic racks allow you to pull the saddle forward out of the cupboard before lifting it off the rack in the English tack cupboard. The light Duo R model is Böckmann’s entry-priced level trailer for the Canadian market (unavailable for the US market). Add stall wall pads or chest/rear stall bar padding at a surcharge. See the Standard Features Tab for the list of quality found on every Duo model. Video Upon its arrival in mid-May! Individually adjustable chest and rear stall bars in each stall – accommodates ponies to 16.3 hands. All wheel mechanical brakes (overrun system) plus parking brake. MSS- External Quick Release stall bar system. Integrated locking coupler plus spare wheel & cover.